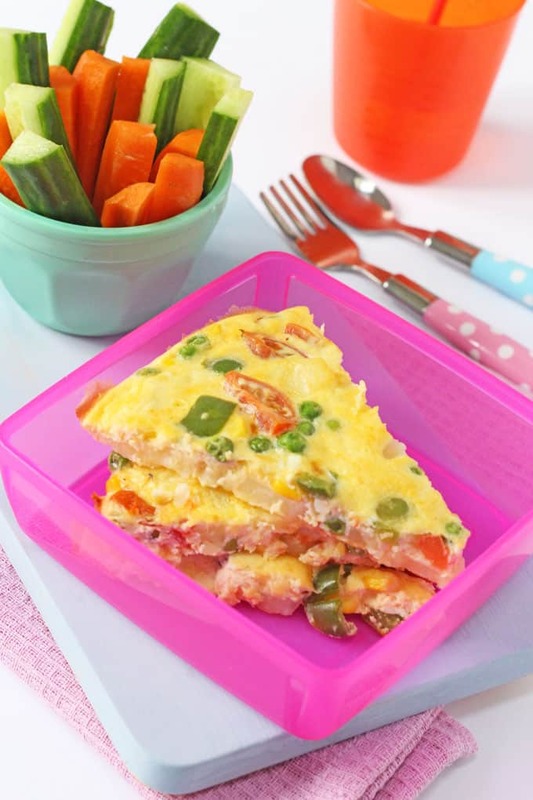 If your kids are already getting bored of sandwiches in their packed lunch then try something a little different and make them this delicious Spanish Omelette. 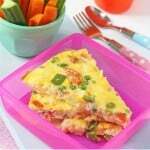 I know that an omelette may not seem like an obvious choice for a lunchbox but trust me, it works a treat! You could keep it warm in a thermos lunch container but I actually prefer it cold. It holds together much better when its cold making it the prefect finger food! Packed full of protein from eggs and cheese and with lots of added veggies, this nutritious lunch will help keep kids full all afternoon. 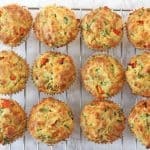 Serve it with wholemeal bread or pitta bread for some slow release carbs and some raw veggie sticks on the side. 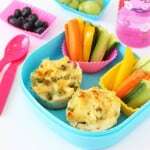 Looking for lunchbox ideas beyond sandwiches? 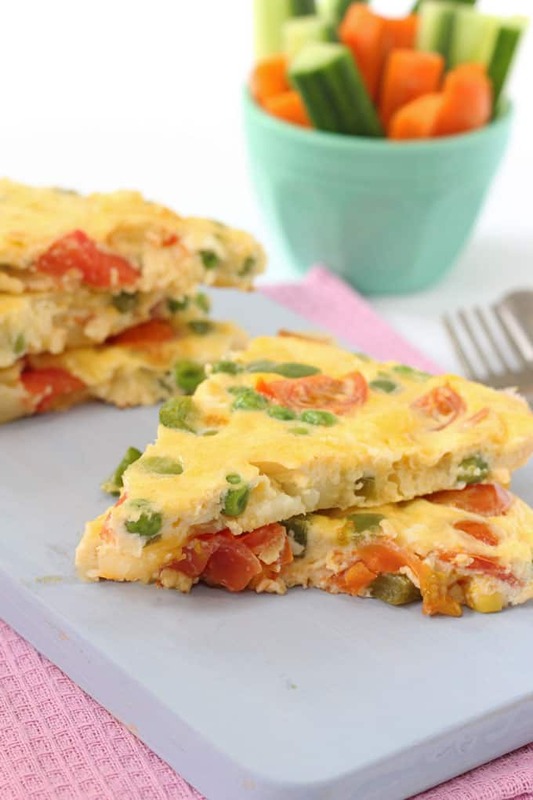 Try this Spanish Omelette packed full of veggies and great hot or cold! Crack the eggs into a large bowl or jug. Add the creme fraiche or cream and whisk with a fork. Add the cheese, season with salt and pepper and mix well. Heat the oil in a large frying pan. Add the cherry tomatoes, green pepper, peas and corn and fry gently for 2 to 3 minutes. Add the sliced potato and continue to cook for another 2 minutes, stirring regularly. Pour the egg mixture on top and stir so that the vegetables are evenly dispersed. Leave to cook for approximately 5 minutes until the omelette has started to set and is coming away from the sides of the pan. At this point you can continue to cook the omelette on the hob for another couple of minutes but I like to put it under the grill for 1 to 2 minutes to ensure the top is fully cooked through. Allow the omelette to cool slightly before cutting into 8 triangles. Serve immediately or allow to cool completely before storing in the fridge in an airtight container or bag. The omelette will keep in the fridge for up to 2 days. This is such a good alternative to sandwiches! 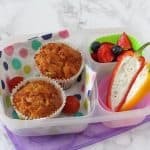 I get stuck in a rut with my son’s lunch box and always seem to put the same things in every week so this made a really nice change and he ate the lot! !